Russian astronaut Yuri Gagarin becomes the first person into outer space, when Vostok spacecraft completed an orbit of the Earth on April 1961 . He travelled about 108 minutes in the spaceship . He was awarded with many medals , including Hero of the Soviet Union , which was the nation's highest honour . Gagarin was born in the Smolensk Oblast, Russia on 9 March 1934 . In his early ages he showed intrest on space and planets . After completing his schooling, he entered into flight training (military) . Later he joined Soviet Air Force and becomes Senior Lieutenant . 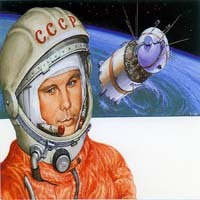 In the year 1960 , he was choosen for "Soviet space program" , and later he got chance to travel in space . In the year of 1968 he died in a jet crash .